Not too long ago, we discussed how to refresh your outdoor seating space just in time for summer. Well, summer is almost over, but that doesn’t mean you should stop maintaining your garden. Your garden can still set a tone when you design it correctly. Besides, you can have a beautiful space to look at in the winter. One of the things you can do to improve your garden is making it look more spacious. With a few simple tweaks, you can create the appearance of a larger space, even when you have a relatively small garden. 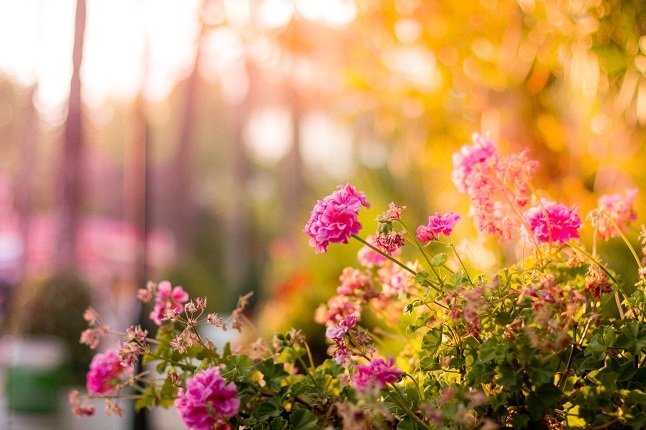 We have just the tips and tricks on how to make your garden appear more spacious in this article. The end of summer is the perfect time to do some garden modifications. You’ll be surprised by how even the smallest tweak can alter the way your garden looks entirely. Before you start adding things to the space, however, decluttering is needed. The last thing you want is a cluttered garden. Even a big garden can appear small when there are a lot of things in it. It is even worse when the plants and other items in the garden are not arranged properly. 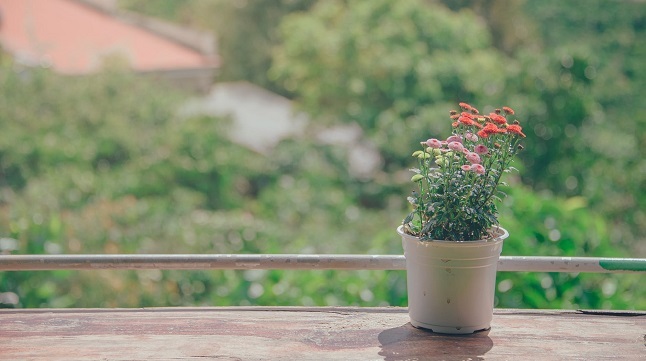 To start with the decluttering process, move everything that can be moved to one corner or outside of the garden. This includes the furniture you add to the space as well as plants and garden accessories. Decluttering lets you get a good look of your space and allows you to start from the beginning. One of the ways you can make the garden appear bigger is by adding different areas to the space. This doesn’t have to be a particularly complex process either. Space – or the illusion of space – can be added by elevating a portion of the garden or introducing lines to the landscape. A pathway is a functional way to divide your garden. You can use the pathway to reach different parts of the space. The lines and curves you add to the landscape also helps make the entire garden appear bigger. Another way you can add areas is by using fencing. Garden fence panels are not only affordable, but also very functional. There are fencing panels in different designs and colours that you can choose from too. When you do use fence panels to add a firm border to the space, make sure you think about the rest of the garden. Choosing a design and texture that complements the space amplifies the effect further. Be sure to browse this range of fence panels for some great options. You can also add dimension and depth to your garden by playing with height. There are two ways you can do this. You can use platforms for potted plants and introduce heights to the space this way. You don’t need bigger plants to achieve the desired effect. Doing it the natural way is an option too. Plants naturally come in different sizes and adding height and dimension to your garden is only a matter of choosing the right plants to use. If you are not sure about which plants to use, consult the local gardener about how big your plants can grow. Lighting is a mix between art and science. On the one hand, you want the space to be lit in a way that makes it moody and comfortable. On the other hand, you also have the option to use lighting to make the garden more spacious than it really is. Lighting is an instrument you can use to your advantage. During the day, using shades and natural light to accentuate certain parts of the garden can really make the entire space feel more comfortable and warmer. For the evening, use LED lights of different shapes to achieve the same goal. Aside from the usual LED bulbs, there are also LED strips and lights in other different forms that are meant to be used in the garden. That last part is important. When lighting the garden, make sure you use lights, cables, and fixtures that are designed to withstand the elements. The garden isn’t that harsh at night but remember that those items still need to stay out during the day. Everyone wants a big garden that looks beautiful and spacious, but not all properties have the space for one. Another trick you can utilise to make your own garden look bigger is by faking the available space. Yes, you can fake it. Many landscapers and designers use mirrors to add more space to a relatively small garden. A well-placed mirror can change a lot of things about your garden. Another thing you can do is to add faux doors or windows to your fence panels. You can also create the illusion of space with water features. Water reflects things around it, which means a well-placed water feature or pond can be just as effective as mirrors. On top of that, you also make the garden look fresh and welcoming by adding water to the space. Last but certainly not least, add areas that are meant to be functional to the garden. Your own potting station, a comfortable sitting area, or even a nice outdoor lounge is easy to set up. These areas don’t need to be excessively big. In fact, it shouldn’t be too big. When thinking about adding a seating area or a functional space to the garden, make sure you also consider scale and proportion. You want the area to match the rest of the garden nicely. You can then add elements like plants to act as a frame for the space to further enhance the effect. Proportion is also important when it comes to the garden furniture you add to the garden. As mentioned before, the last thing you want is a garden that looks cluttered and too full of things. Using scale, you can avoid this entirely and have a garden that looks much, much bigger than its actual size. Having a home that you are proud of is important and there are many different ways that you can achieve this goal. If you are trying to improve your home, then you should think about adding some new elements of design. One of the best ways that you can improve your home is to add some fine art or paintings. In this article, we are going to discuss how art can improve your home. Make sure to keep reading if you’d like to find out more. One of the best reasons for adding art to your home is that you can change it regularly. Some people get bored with the décor of their room but if you create a sort of rotating gallery then you can update your room with a new painting when you want. Rotating galleries are great for keeping your home up to date with the latest seasons and art trends. Make sure to consider this if you want to improve your home. Having art in your home is also great as it can add another layer of colour. Dark coloured rooms can be brightened up with bold paintings and pale rooms can be made more exciting with a nice piece of art. Adding colour is very important and when you choose art for your home you can really make a huge difference. If you really want to make a statement in your home, then you should think about adding some art. Art can be really important in adding something that is bold and interesting to your room. You want your guest to walk in and be amazed by the décor and when you have a statement piece, you can be sure that this is going to happen. Another reason why art can improve your home is that it can actually add some movement to the room. If you choose certain pieces that will move the gaze of the guest around the room or that work well with your furniture choices, you can really change the way that the room is viewed. Your guest’s gaze will be guided, and they will appreciate what you have done with your home. With art, you don’t always have to choose a print piece or a painting that has no texture. Art comes in many different forms and if you are able to find a textured piece to add to your home, you’ll be able to add this texture to your home. This can make a huge difference to how your room looks, and it is something which you should try. There are many reasons why art can actually improve the way that your home looks. Think about how the piece that you choose can add some colour, texture or movement to your home. You will love how nice your room looks when you find that perfect piece. Quality and value. These are two reasons why you should seriously consider doing some renovations in your home. If you either want to live under significantly better conditions or you want to make your home increase in value than it would fetch in its current state before the renovations. Looking at it, this is a win-win situation. Even if you do not end up selling your house, there’s nothing that brightens your mood faster than being able to finally use your new and upgraded kitchen. Many homeowners are however inadequately informed about which areas in their homes they need to focus their attention on. Areas that will not only look good but also areas that can simultaneously significantly add value. You may want to have a master bedroom suite, but it would be better to install that steel front door in place of that frail wooden door. It is not very much about how much money you use for an upgrade, but more about where you focus this money. At the end of the day, several factors determine how good or bad your renovation idea is. So how do you know whether a renovation project is going to add value or not? Taking a risk and spending too much money on a small upgrade reduces the chance of making good returns. Average spending more often than not translates into a valuable addition. For instance, an ostentatious kitchen would bring significantly low returns than a mid-range kitchen project. Is your focus inside or outside? In the real estate world, the first impression means everything. How your home looks on the outside can open or close the door to opportunity when you want to sell. Exterior renovation projects have been found to bring better returns than interior renovation projects. Remember that projects that cannot be seen when standing in front of the house are also considered interior because they are not part of the view. If you reside in an area where it is relatively cold most of the months in a year, then it would mean more value to renovate the interiors of your house where the owners spend the most time. On the other hand, if your home is located in an area where the climate is warmer, it makes more sense to focus efforts on the exteriors of your house. A 20-gauge steel door is purposefully made to provide your home with security and to complement the face of your property. This steel door is a significant upgrade from the good old 36” by 80” wooden or iron door. It comes ready-made by the manufacturers. No glass panel, hinges or other additional accessories are required. Simply unload and install. On average, a steel door costs $1,471 and brings a 91.3% return of $1,344. Most houses use vinyl siding which tends to wear off faster. Manufactured stone veneer is not only durable but brings with it significant curb appeal. On average, installing stone veneer costs $8,221 and would bring back $7,986 hence a 97.1 return on investment. Replacing your garage door stands top among the list of best return on investment-ROI projects. Say your current garage door measures 16ft by 7ft and you want to replace it with a heavy duty garage door with steel tracks. This seemingly simple renovation project can help sell your home in an instant. A good garage door on average costs $3,470 with its resale value being $3,411 which translates into a 98.3% return. Say your kitchen measures 200 sq. ft. and has fitted cabinets covering at least 30 ft. seek to have the cabinets upgraded with stylish wood panels and attractive drawer fronts. Have old electric cooking appliances upgraded with new yet more energy saving ones. Also, it’s wise to have your old countertop laminate replaced with fresh laminate. Likewise, you should install a new sink and taps, add a new coat of paint and re-do your old floors by getting new vinyl tiles. A full kitchen renovation would cost an average of $21,198 and bring a return on investment ROI of $17,193 or 81.1%. Quite impressive don’t you think? From the start, our sanctuaries have been one of the sought shelters from the elements. We have been experimenting with excellent materials to fit the quality structural element that will hold the roof itself to last. 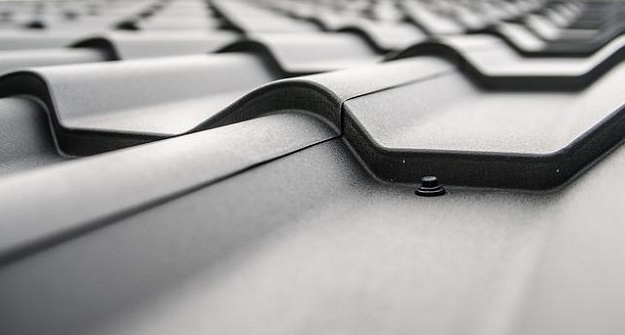 Choosing the best roofing design requires full attention to the roof’s exterior surfacing such as how the trim is connected, the shielding of the soffit on the underside where the roof hang. Roofing is the primary defense between your home and Mother Nature. Ideal roofing withstands the harsh sun and the strong weather conditions. There are several roof types that serve different purposes for such weather condition and building designs. Knowing which roof is suitable can be overwhelming. Roofing can be hassle-free when you choose excellent quality, services and value for your money. The cottage-like design never gets old. It’s brick cladding and roof makes your new home like it is been there for centuries. Most private homes these days go back to thatched cottages for a quaint-like country feels once you get in. The sight itself could give you an experience of a down to earth, romantic roof with this dwelling. Anne Hathaway’s Cottage located in Stratford-upon-Avon is one of the famous thatched cottages. A contemporary classic combination of steel, stone, and glazing that makes your house captivating with its interesting upside-down arrangement. A Distinct characteristic of Japanese architecture is that it has skillful use of different wood types. Some other characteristics include the use of natural wood color over paint, visible columns and other structural elements. Another known example of traditional Japanese architecture is shown in Shinto Shrines, Buddhist temples, castles, houses and even tea houses. A softly curved roof is a rare modern structure that works much like a basic roof. This consists of one huge large surface which is built to be wind resistant and proven to have relatively low maintenance. This modern style is all about standing out from the crowd due to its unique aesthetic style. This design is popular for homes, garages, cottages and even coffee shops. A slope feature creates an impressive sloping roof which perfectly mirrors the fall of the house or the building. Sloping roofs are common in residential and commercial. This roof design does not let the water or dirt to accumulate by just letting them slide off. Sloped roofs can take various shapes. The variety of shapes can be applied depending on the house-owners and their needs and preferences. Origami is originated from the ancient Japanese art form created by folding papers. Origami roof design popularized in the mid-1900s is influenced by the Japanese culture making an impact on the worldwide architectural design. This architectural symmetry and classic materials add gracious to the brick exterior with a top asphalted roof featuring two gables and three dormers placed above the centered front entry. A copper window with a wooden entry door enhances the home exterior structure. If you live in a country where it snows, this roof provides more space, ventilation for the attic or ceilings with vaults. This simple design is easy to build and cheaper than other complex roof designs. Any type of material including asphalt shingles, metal, clay, and cedar shakes can be covered by gabled roofs. A hip roof has all equal length sides and attached together at the top to form a ridge on all four sides. This roofing design is more stable than gable roofs. The inward slopestyle makes it more sturdy and durable. Hip roofs are excellent for both windy and snowy areas. The designed slant of the roof allows the snow to slip off with no water accumulation. 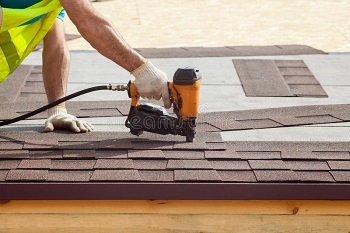 Referred to as a shed roof or lean-to, is a single, sloping roof typically attached to a taller wall, is often used for home extensions, porch, and sheds. They are now popular with the more modernized style homes. Skillions are easy to construct and uses fewer building materials than any other roofing designs. Whether you are building a new house or thinking of repairing your existing roof, carefully choosing the right type of roof can be sometimes challenging than you could ever imagine. Roofs provide more than just the practical purpose of protecting the house structure itself, but also the household from the elements from mother nature. Indeed, a roof’s design and shape play a vital role in giving the impression and the overall look design of a house. If you are looking for a home roof replacement, roofing and roof installers, a service from Patriot Roofing & Construction can check on your roof and give you an estimate of any work or services that need to be done. Set an appointment with us or visit www.prcroofingpro.com or more information. Family time is the best! You will definitely prove me right as soon as you go through and practice the below list of activities. You have been working very hard to provide necessities to your family and so that means you care for them. However, your little ones may not really understand how much you care and love them without you taking some actions and let them see. Spending some time with them no matter how little, will make a difference. Why not make it more fun and memorable by enjoying some outdoor activities together? Go karting is a fun activities for all the family members. It is safe as it comes with its safety rules; such as; wearing the helmet and Putting on the safety belt. Having your children to always follow the go karting rule will make them to always obey rule and regulation even in future. It will also help them to be able to control other automobiles. You can try go kart racing as a family and enjoy it more. It is a nice activity to help you unwind after having a hectic working moments. Go karts comes with different sizes and model, check Gokartsreview.Com for the review. This is another activity that will make you bond more with your family. Plan for a sunny weekend and take your family with you carry your swim suit and go have fun together. If you live near the coastal area you can enjoy it on the beach while having other fun beach games. Surprise your family with a road trip of a lifetime. You can hire a driver or a tourist van, either way is good provided you’re not the one driving. This is to make sure you will enjoy maximally. Make sure to take the best camera with you, enough snack and drinks. It’s also good to leave early so that you can explore more places before the nightfall. Nothing makes kids happier than riding bikes. Their joy will be overwhelmed seeing their parent riding together with them. Simply get each person a bike carry some water and go riding. You can ride on your local park and avoid riding on a slippery floor. You can also suggest you do bike racing and your kids will enjoy it more. Get some time preferably in the evening and take a walk together with your family members. This is not only going to help you have a strong bond but it’s also an exercise that will make you and your family to be healthy. Chat with your kids and advise them as you take a walk. The above activities are not only fun but they will also help you to relax your mind and be more productive as you go back to work. Make it a schedule to be with your family once in a while and enjoy the nature together.